Procam International, promoters of the IAAF Gold Label Tata Mumbai Marathon, outlined arrangements that are in place for the 46,000+ participants on Sunday, 20th January 2019. Hugh Jones- Race Director, Dr. Vijay D’Silva-Medical Director, Vivek Singh, Jt. MD Procam International and P N Sankaran-Director, Operations Representative highlighted the medical facilities, various facilities at the start/finish and the new route and timings for the event. On the announcement, Hugh Jones, Race Director said: “There is a slight change this year along the route around the finish lines. We have various finish points for an improved experience. Marathon Amateurs, Half Marathoners, and participants in the Timed 10km Run will be finishing at Hazarimal Somani Marg. We are also going to start early so that the marathoners have covered a good amount of length before the sun hits them. We will have less conflict with moving traffic, and also have taken into consideration the ongoing metro construction work. We have managed to have a straight run for the elite runners. This year we have less turns and kept only one u-turn, which is at Nariman Point. 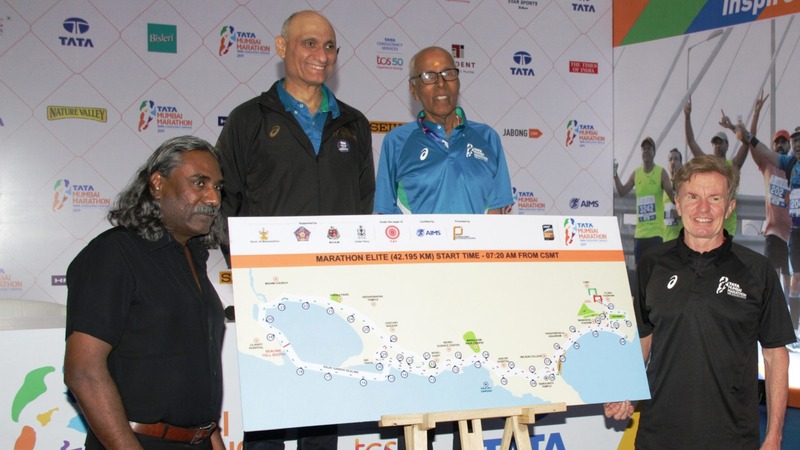 All these changes will ensure that both runners and spectators enjoy a smooth race during Tata Mumbai Marathon 2019." The 16thedition of the event will observeslight changes in the route in timing, start and finish lines across categories. Runners are Tata Mumbai Marathon’s biggest stakeholders and Procam will continue with deploying initiatives towards making race day more memorable for all participants. Asian Heart Institute (AHI), the Medical Partner to the event for the past fifteen years in succession has contributed state-of-the-art facilities and services for the runners. With its entire medical infrastructure in place, Asian Heart Institute can aptly handle any medical emergency - injuries, dehydration, or any other complication arising due to long distance running, along the route. Spotter placed every 100m for the last 2kms of the race to identify participants who need medical attention. Free Shuttle Service: For the convenience of all the confirmed Half Marathon participants,a total of 55free shuttle service will be functional. The service will run from outside Mahalaxmi (western line) and Parel (central line) railway stations between 3:30 am and 4:45 am. Participants travelling by Car/ Radio Taxis from North Mumbai:Runners from North Mumbai, using vehicles to get dropped off for the event, can ply upto the Doordarshan Bhavan – shuttle bus services will operate from Doordarshan Bhavan to Worli Dairy, between 3:45 am and 4:50 am. For the convenience of the participants, the following facilities are available along the route and at the start/finish. Flora Fountain, Jazz By the Bay - Marine Drive, Marine Drive near Bank of Baroda opposite Sonewala Building, Chowpatty, Peddar Road opposite Kenilworth, Lala College opposite Lala Lajpat Marg, Worli Sea Face , Opposite Worli Depot, Thadani Marg of Pochkanwala Road, Old Passport Office, Shivaji Park, Opposite Koliwada Mahim Causeway, Bandra Reclamation before the Toll Naka, Bandra - Worli Sea Link (tentative), INS Trata, Worli Sea Face Bombay Dyeing Junction, Mela Restaurant, Nehru Planetarium, Cadbury House, Babulnath, Chowpatty, Outside Wilson Gymkhana, Marine Drive – SonewalaBuilding,Churchgate outside Stadium Hotel, Parsi Dairy after Princess Street Flyover, Hazarimal Somani Marg, Mahatma Gandhi Road. ORSL Restoration Stations: Jaslok Hospital at Peddar Road, Bandra Worli Sea Link, Bandra Reclamation, Veer Savarkar Marg near Mayor Bungalow, Worli Sea Face before Bombay Dyeing Junction, LalaLajpatrai Marg outside Lala College, Marine Drive outside Wilson Gymkhana, D N Road. Race Day proceedings will be liveon Star Sports 1, Star Sports HD 1 and Hotstar the Channel Partner from 7.00 am to 11.30 am.